which was designed for keeping an animal drinking trough full. Water under pressure is admitted in the bottom port of the valve, and leaves the outlet into the trough. The valve is intended to be mounted through the wall of the trough. 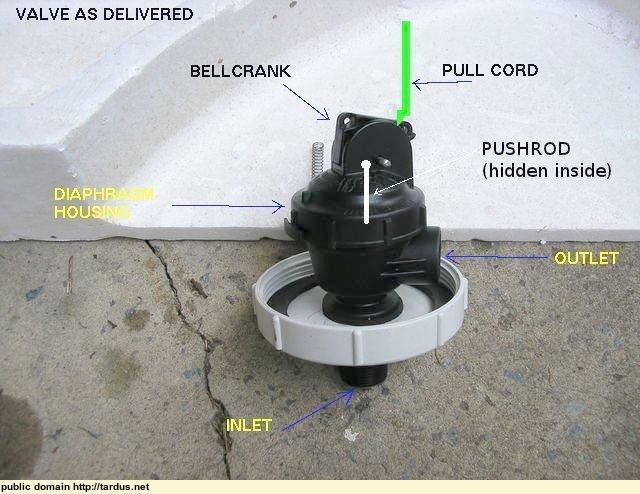 When the water level is sufficiently high, the float pulls the cord attached to the bell-crank and stops the flow. 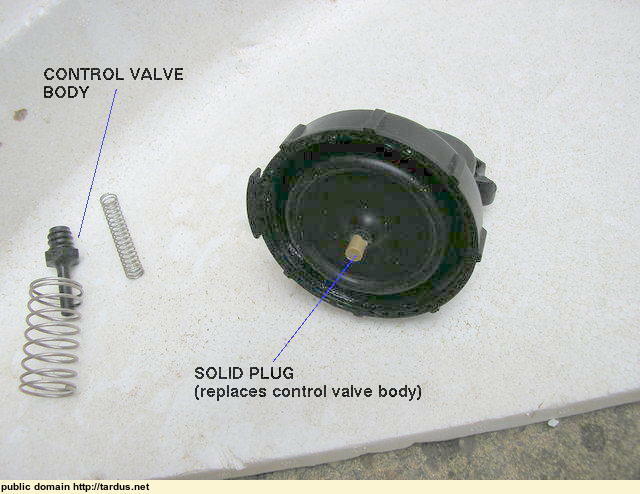 The push-rod attached to the bell-crank slides down the centre of the black nozzle in the control valve body (among the bits left out below) activating the diaphragm valve. Sorry, I didn't take a photo close-up of the diaphragm. However, it follows the standard design for such valves, as used commonly in washing machines, etc. The main spring is light to permit easy operation, but is not strong enough to close the diaphragm valve against the inlet water pressure. 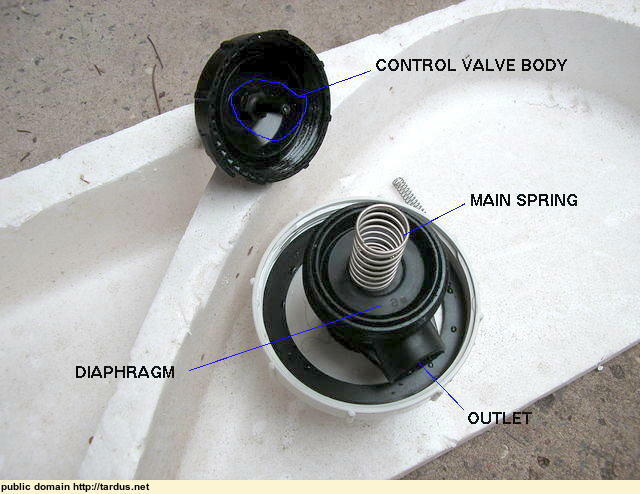 By allowing the water pressure itself to push on the diaphragm along with the spring, it is enough to keep it closed. A light force opens a port in the control nozzle and releases the water pressure holding the valve shut. 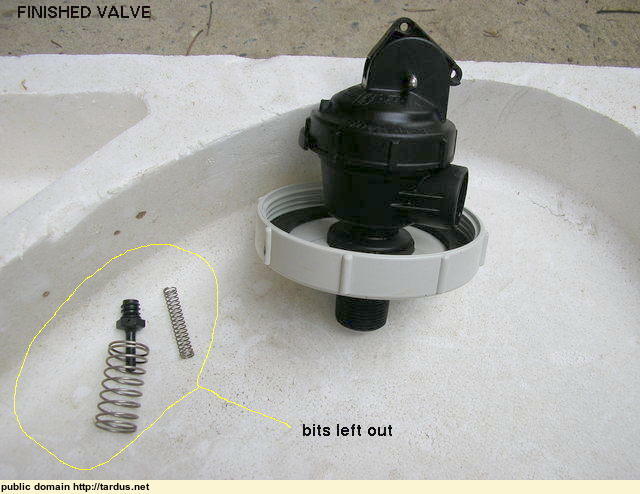 The unbalanced water pressure from the inlet side then overcomes the spring and opens the valve. Essentially is an hydraulic amplifier. Why did I need to modify it? Simply this; the inlet water pressure from the upper tanks is very low - as little as 100mm of water level difference when the upper tanks are almost empty. There just was not enough pressure to force the diaphragm up against the spring. 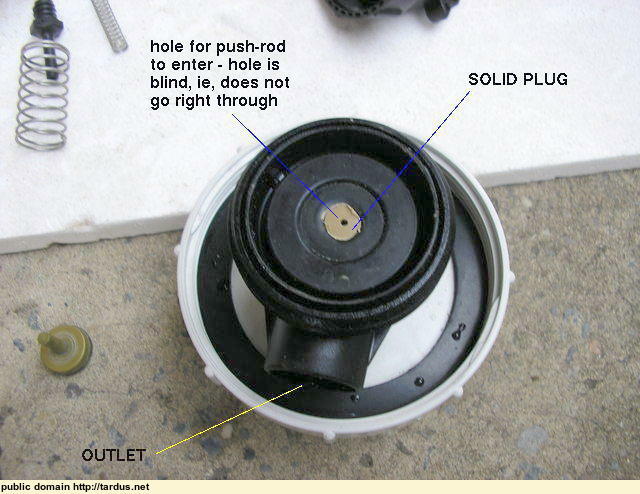 after some experimentation, the solution was to just use the push-rod to hold the diaphragm closed, without any spring in place. When the float is low and the push-rod high the inlet pressure has only to lift the tiny weight of the diaphragm itself to reach the outlet. this required a solid plug to close the centre hole of the diaphragm. 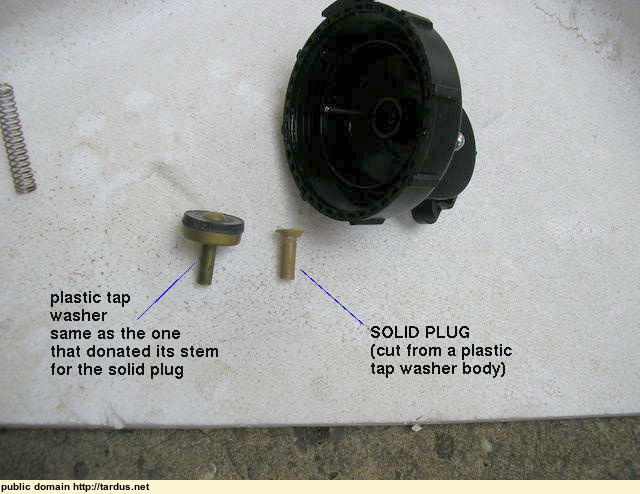 I found a plastic domestic tap washer's shank fitted nicely and cut the plug from it, leaving a neat fillet (a bit like a countersunk screw) to prevent the plug being pushed through the diaphragm. The valve now works well. Once the main tanks drop to 300mm below their full level, the valve opens and drains the upper tanks progressively. Once they are empty the main tank level drops as water is used up. I picked the 300mm level as the main tanks are so much larger than the upper ones. It may not be optimal, but a bit of experiment will help pick the final setting. My guess is that 600mm may work better, ie, at about 2400 litres free space in the main tanks, the upper tanks will be empty, ready to receive fresh rainfall, as are the main (lower) tanks). The valve is mounted at the bottom a vertical 90mm PVC pipe connected to the main tanks. The level at which it closes is adjusted by adjusting the length of the cord attached to a float made from a plastic bottle, in the upper part of the pipe. 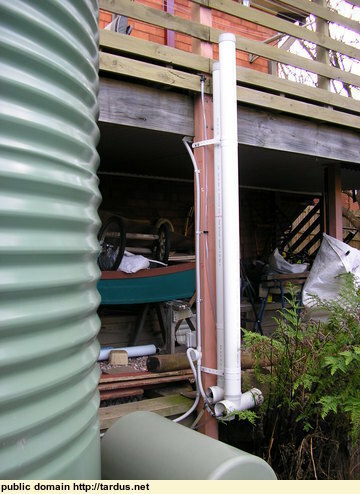 The top of the pipe is closed with a mosquito proof cap, as it needs to be open to atmospheric pressure, to permit the water level in the pipe to rise and fall with that of the main tanks.